Check installation condition of power steering gear assembly, front suspension, front drive shaft and steering column. Check if movement exists when steering wheel is moved up and down, to the left and right and to the axial direction. Steering wheel axial end play : Refer to ST-18, "Steering Wheel". Verify that the power steering gear nuts are tightened to specification. Refer to ST-10, "Exploded View". Turn tires straight ahead, start engine, then turn steering wheel to the left and right lightly. Measure steering wheel movement on the outer circumference of the steering wheel when it is turned to the point where tires start moving. Steering wheel play : Refer to ST-18, "Steering Wheel". Check neutral position on steering wheel after confirming that front wheel alignment is correct. Refer to FSU- 23, "Wheel Alignment (Unladen*1)". Turn tires straight ahead, check if steering wheel is in the neutral position. If the neutral position cannot be attained by repositioning the steering wheel two teeth or less on steering stem, loosen outer socket lock nuts of power steering gear outer sockets, then adjust outer sockets by the same amount in the opposite direction. Park vehicle on a level and dry surface, set parking brake. Tires need to be inflated to normal pressure. Refer to WT-54, "Tire Air Pressure". 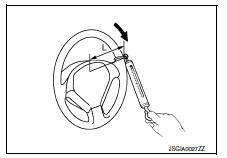 Check steering wheel turning force using Tool when steering wheel has been turned 360В° from the neutral position. Steering wheel turning force : Refer to ST-18, "Steering Wheel". erform toe-in inspection. Refer to FSU-6, "Inspection". Perform front wheel turning angle inspection, after toe-in inspection. Place front wheels on turning radius gauges and rear wheels on stands, so that vehicle can be level. Check the maximum inner and outer wheel turning angles for (RH/LH) road wheels. With the engine at idle, turn steering wheel from full left stop to full right stop and measure the turning angles. Inner wheel (Angle: A) : Refer to ST-18, "Steering Angle". Outer wheel (Angle: B) : Refer to ST-18, "Steering Angle". Check the following items when turning angle is out of the standard. 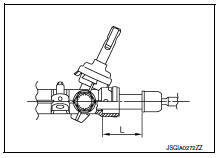 (L) : Refer to ST-19, "Power Steering Gear". If rack stroke is out of specification, replace steering gear assembly. Steering angles are not adjustable. Check steering gear assembly, steering column assembly, and front suspension components for wear or damage if any of the turning angles are different from the specified value. Replace any of them, if any non-standard condition exists.